On the face of it, the casualty figures in Gaza may seem not that horrific to Americans -- unless you transpose that same level of death and mayhem to the United States, 176 times the population of Gaza. 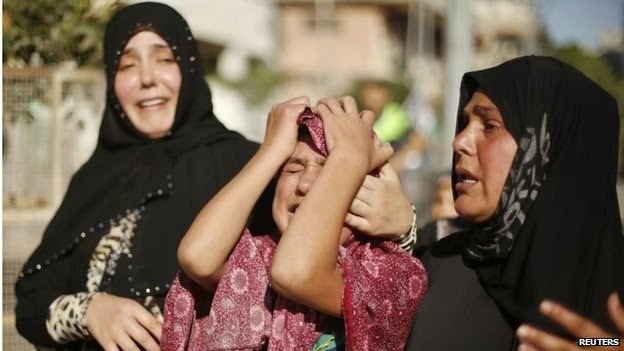 For instance, so far reportedly 571 Palestinians have been killed, including 154 children. The total wounded are approximately 3,550, of which 1,125 are children. If the United States were to be hit by a similar bloody onslaught, the number of Americans killed--most in just five days -- would be 101,000, of which 27,000 would be children. The number of Americans wounded would be 627,000, of which 198,000 are children. That number of dead Americans would be almost twice the number of soldiers that the United States lost in 10 years of fighting in Vietnam. (58,000). It would almost equal to the 116,000 American soldiers killed in World War I. It's more than one third of the Americans killed (291,000) fighting between 1941 and 1945 in World War II. It's almost equal, however, to the total number of American soldiers wounded. (670,000) in WWII. And remember: the great majority of those Palestinian deaths have occurred in just five days. And a large proportion of those killed were civilians not soldiers. Barry Lando, Author, "The Watchman's File"